We're talking with law enforcement about how the government shutdown is affecting the Northern Border. 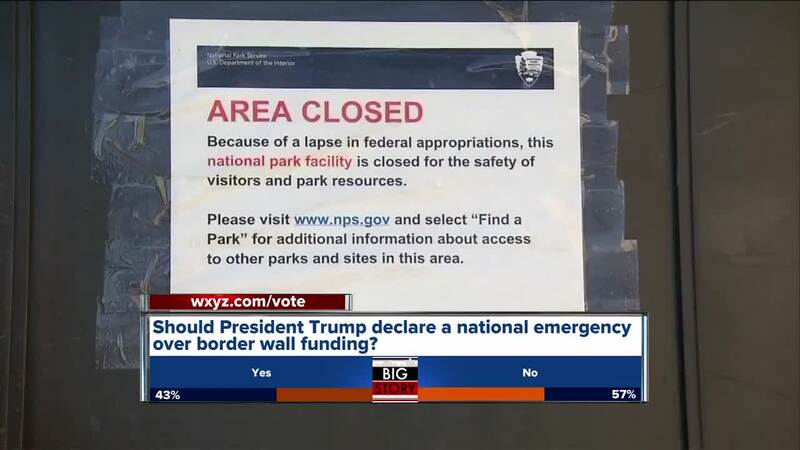 (WXYZ) — When you hear the words “border security,” you probably think about the national debate over the wall and our southern border. St. Clair County Sheriff Timothy Donnellon thinks about his duty to keep you safe right here at home. “Don’t forget about our northern border,” Sheriff Donnellon said. St. Clair County has the largest international border of all counties in Michigan. While the government shutdown makes it hard to get the most up to date statistics, in 2017 the Detroit Office of Customs and Border Protection reported about 1,070 arrests. Some of them were made possible with the help of Saint Clair deputies who work with Customs and Border Protection to fight drug smuggling, human trafficking, and even terrorism. 7 Action News has gone for ride-a-longs with CBP agents in the past showing you enforcement efforts from the sky, by water and on the ground. Agents spoke about the challenges of patrolling the waterways along neighborhoods. In places where the crossing is so narrow the waters freeze over the winter, allowing people to try to walk from Canada to the United States, something police say has happened. “There is a lot that goes on on this northern border and a lot of time it is not talked about because you don’t have drug cartels beheading people, but it has its own issues,” Donnellon said. Donnellon added he has seen cuts in programs that provided extra patrols along the northern border in the past. He wants lawmakers to make sure the funding to secure the border in his “backyard” is provided.